SINN FÉIN, the Technical Group, and a number of independent TDs and senators, including two from Fianna Fáil, have written to President Michael D Higgins asking him not to rubberstamp the Water Services Bill. Two letters, one from Sinn Féin with 38 signatures and another from Reform Alliance senator Fidelma Healy-Eames with 12 signatures, have gone to the President in the last 24 hours asking him to refer the Bill to the Council of State under Article 26 of the Constitution. Between the two letters a total of 49 TDs and Senators (one has his name on both) have appealed to the President over the legislation passed through the Seanad on Monday evening. The Sinn Féin letter sent to the President asks him to utilise Article 26 which allows the President – after consulting with his Council of State – to refer a bill to the Supreme Court to test its constitutionality. It appears that the group had earlier considered asking the President to basically put the issue to a referendum under Article 27 but rowed back on that when the Office of the President pointed out that it wouldn’t apply here as the Bill has already been passed through both the Dáil and Seanad. 1. There is such a degree of widespread public opposition to the imposition of charges for water as proposed under Section 3(2) of the Bill that such a proposal should be put to the people by way of referendum or by holding of a general election before such charges are introduced. 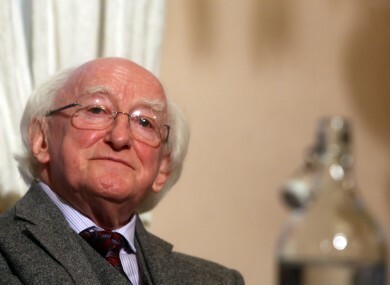 The office of President Higgins wrote back a rather more-politely worded reply. The Article 27 suggestion is gently rebuffed but the President is “considering” the group’s request that he invoke Article 26. The letter to the President was signed by: Brian Stanley TD; Gerry Adams TD; Senator David Cullinane; Senator Trevor Ó Clochartaigh; Senator Kathryn Reilly; Jonathan O’Brien TD; Caoimhghín Ó Caoláin TD; Mary Lou McDonald TD; Michael Colreavy TD; Seán Crowe TD; Pearse Doherty TD; Dessie Ellis TD; Martin Ferris TD; Pádraig Mac Lochlainn TD; Sandra McLellan TD; Aengus Ó Snodaigh TD; Peadar Toibín TD; Róisín Shorthall TD; Tommy Broughan TD; Catherine Murphy TD; Richard Boyd Barrett TD; Ruth Coppinger TD; Joan Collins TD; Thomas Pringle TD; Joe Higgins TD; Finian McGrath TD; Mick Wallace TD; Shane Ross TD; Maureen O’Sullivan TD; Paul Murphy TD; Mattie McGrath TD; Thomas Fleming TD; Stephen Donnelly TD; Clare Daly TD; Senator Gerard Craughwell; Seamus Healy TD; John Halligan TD; Michael Fitzmaurice TD. In a further bid to have the Water Services Bill referred to the Council of State, Healy-Eames has written on behalf of 12 senators, including two from Fianna Fáil, to the President imploring him to consider such a move. Healy-Eames said the president was being petitioned on the grounds that the current legislation leaves the door open to future privatisation, Irish Water is not subject to scrutiny by the Comptroller and Auditor General and water charges are a regressive tax. The letter to the president includes a petition signed by independent senators David Norris, Seán D Barrett, John Crown, Feargal Quinn, Fidelma Healy-Eames, Rónán Mullen, Katherine Zappone, Mary Ann O’Brien, Gerard Craughwell, Paul Bradford as well as Fianna Fáil’s Jim Walsh and Brian Ó Domhnaill. Email “49 TDs and senators in eleventh-hour appeal to Michael D over Water Bill”. 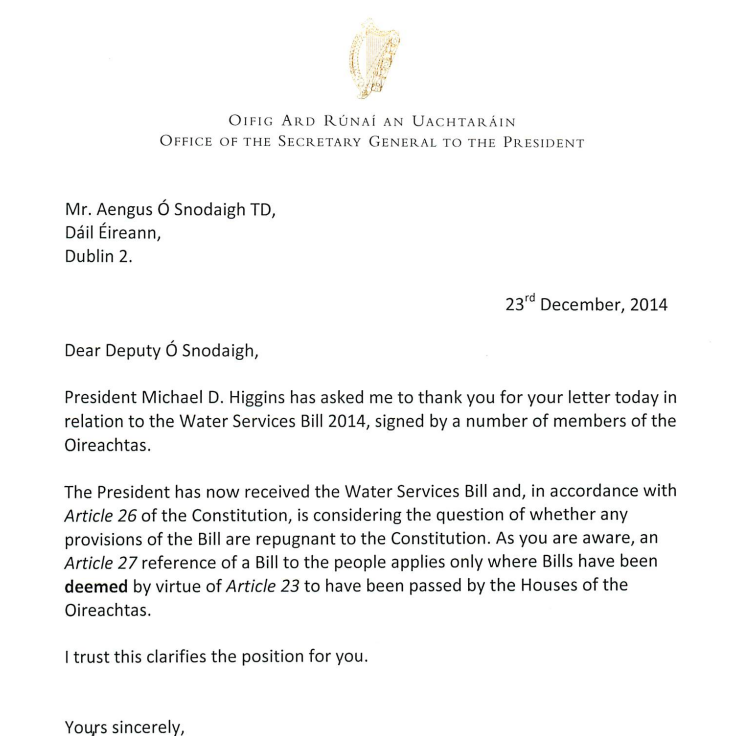 Feedback on “49 TDs and senators in eleventh-hour appeal to Michael D over Water Bill”.